Just a curious conversation on what team you use for raiding? Mines mixed a bit. Due to game balance, you can almost always expect to encounter 2-3 harm accelerators and generally that means a Grindor on the first node. A Mirage on a Laser mod node is almost always a given as well, while Bonegrinder is a pretty much guaranteed staple as well. For me, this basically means MV1 Prime is pretty much mandatory. Beyond him, the rest of my team is a mix of Ironhide, Barricade, Ratchet and Bumblebee. Barricade is a more and more popular choice as tech opponents seem to be more and more common. Mv1, barricade, and bee. Good synergies, prime for obvious reasons, bee's heavy attack buff stack wrecks opponents, plus his shock, and he's a class bonus against brawlers, which are among the most commonly placed and most difficult defenders to face, I'm. And barricade's power control and bonus against techs is awesome. First off the bench would be Bonecrusher, who is a beast, but he doesn't bring as much to the table as those three, at least against what we're seeing right now, and his class bonus is against scouts, who aren't really that tough to face in raids, at least right now, imo. I don't have an Ironhide, but what I'd like is a tech for friggin waspinator, lol. He's a terror. This is my raid squad. The highest base rating I've tried and beat was around 7500. 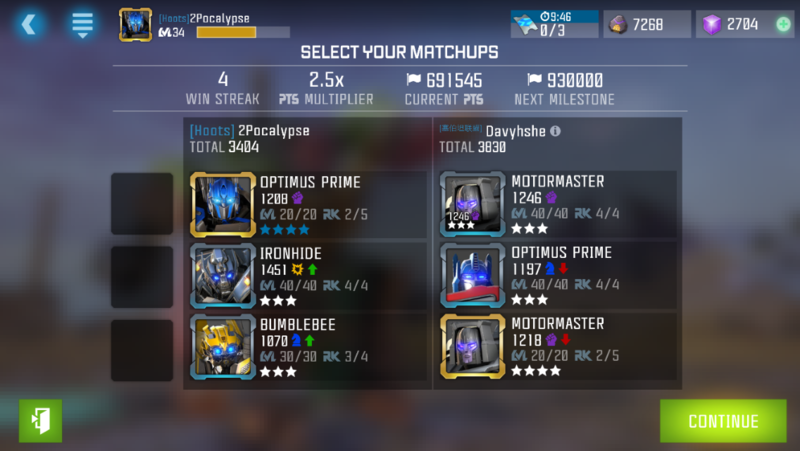 Most of the time l can take out the first three bots with prime then clean up with iron and bee. I use CW Prime, Motormaster and,third to taste based on what mix of troops the raid target has but usually Ironhide, Rhinox or sometimes Bludgeon. CW Prime is great for the Grindor first node. From there a mix of Motormaster and third is usually enough to smash through the base. I've taken as high as 6500 rated bases but since my bots are still 3/30(Only a few hundred more essence to go for first alpha) I don't go,hitting 7k bases yet. For raiding I use OG Prime, Grindor and Soundwave. That is a solid set that wrecks pretty much every base. Team Beast Purification with Primal, Dinobot, and Rhinox, solely because I hate HA and I'm tired of always having to bring Grim/Mv1 just to deal with it. I like to bring along Dinobot since he's honestly pretty good against brawlers. Armour pierce and armour breaks are nice. It helps there's a Grindor in almost every base, which is a free win for DB. +1 for Beast Purification team. The first time I purified a harm accelerator my life changed. If a.m. is on I use prowl, mv1, and mirage. Between a.m. it's OG Prime, hide and arcee. 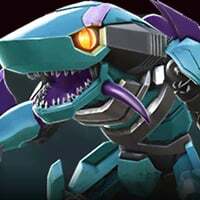 I have MV1 every time no matter what and if he is in dispose, Grimlock...for the HAs... My others are Prowl, Soundwave, Ironhide, and Blue Megatron...depending on what's on the base.